From logos and branding design, all manner of print design, WordPress websites and almost everything in between, we have developed a portfolio of work that is both diverse and well-rounded. Good design gets results. It creates connections and exceeds expectations. One of our main principals is to focus on helping you, our client, get your job done. In our work, there is nothing more important than making sure that your project gets done efficiently, reliably, and to your utmost satisfaction. We’re proud of our top-notch graphic design, website design and outstanding, reliable service. We do what we say we’re going to do. We’re also very responsive. We answer the phone and call back right away when we’re not available. The same with e-mail. Our standard turnaround for changes is less than 24 hours, usually the same day. River Graphics began in 1988 as a print-oriented graphic design firm. Existing technologies grew and new ones, like the Internet, took off. In 1995 we added website design to our list of services for our existing clients. Our interest in new technologies lets us combine strong technical know-how with great design. Owners Steven and Barbara Wolock stand by a strong commitment to exacting quality and great service. Today, our work ranges from WordPress websites to reports and catalogs to large-scale exhibit work. 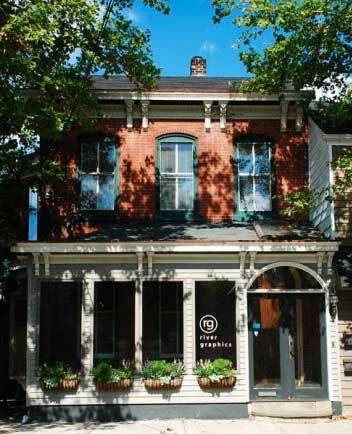 We work in a renovated 1860s Victorian building in historic Lambertville, New Jersey. Please visit if you’re in town. We talk to you, our client, about your project: your goals and expectations; who your audience is; who are the decision-makers (you, your boss, your boss’s boss); budget; deadlines; technical details, etc. We create some initial ideas, layouts, or comps as a starting point. For example, for a website design we might do three initial layouts, each with a home page and a couple of internal pages. For a report we would typically do three initial layouts each with a cover and an inside spread or two. These are usually shared with you as PDFs. Based on your feedback from step 2, the final design is developed. In the case of the website, we’d get to work on the actual web pages on our development server. For the report, we’d create the final report with the text, images, graphs, etc. The project continues to be shared with you for changes and corrections until everything looks great. Usually, this involves you reviewing PDFs or web pages and sending us corrections and changes. The files for the project are finalized and sent to whoever or wherever they need to go. For websites, they go to the production server. For a print project they are sent the printer. For an ad, they go to the publication. Websites are thoroughly tested to make ensure that everything was successfully transfered from the development server to the production server. Pre-delivery is the end of the line for some projects, but others are produced, printed, or packaged. In this case, we’ll be sure to follow the project while it’s at the vendor to make sure everyone is happy and the project is delivered to you in great shape.